A few weeks ago, Discovery Channel aired one of the worst pseudo-science documentaries in its history. Called Eaten Alive, it was about what would happen if a giant anaconda tried to eat a person. Now, the environmental researcher behind the documentary says he still thinks it was a good idea. 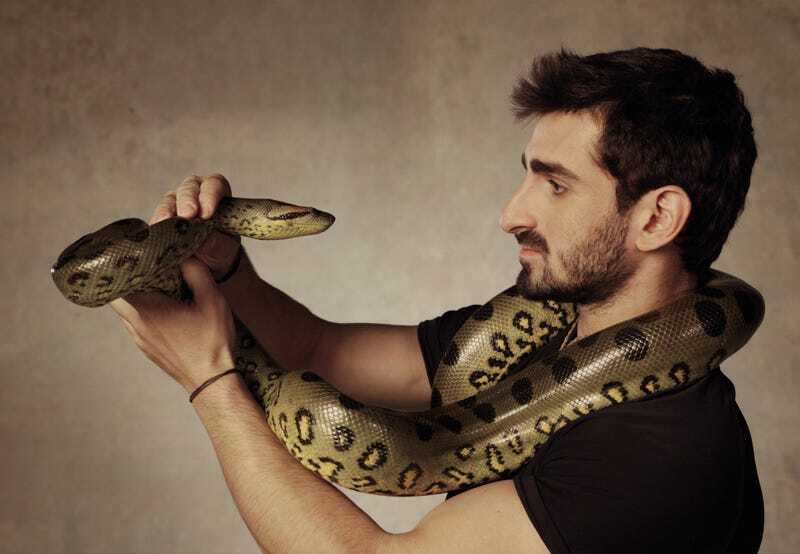 Naturalist Paul Rosolie, who has won praise from the U.N. and activists like Bill McKibben for his work, says he took the job with Discovery because he desperately wanted to study anacondas in the Amazon. With little funding available for conservation biology, he thought that getting eaten by a snake on TV would be a small price to pay for good scientific work. In a long article on Mongabay, Rosolie explains all the research he and his colleagues were able to do, thanks to Discovery bankrolling their trip. Rosolie, who has a degree in environmental science, brought several working scientists with his team. They studied over a dozen of the endangered snakes, tracked their movements in their natural habitats, and investigated the agricultural and mining practices that threaten the snakes' environment. All of that sounds great, and reminds me of similar comments from scientists who have taken money from National Geographic to make splashy adventure specials while also doing important research work. The difference is that National Geographic actually focuses on the science, and doesn't require anybody to do creepy stunts with animals to justify their work. In the final cut, I was shocked to find that all of that footage of burnt down rainforests and insidiously destructive gold mining that I had filmed was nowhere to be seen. Nowhere did it show the context of our study on anacondas and the potential implications of our findings. Nowhere did it show the dozen smaller anacondas we captured and measured with just as much enthusiasm and awe as the large ones. And worst of all, the show left out the devastation that is so near to the floating forest —instead the producers wanted a 'deep jungle' feel. And even apart from the science and 'educational' elements, there was much to be missed. My team and I are all experienced in the field; we know the forest well and were proud to show our field craft and love of the world's greatest forest. But none of that footage was shown either. I am still at a loss to describe the sinking sensation I felt when I saw the final cut. The show that the editors had cobbled together contained very little ecological science, and included just the faintest mention of conservation (without any visual context). It was a crippling end to a project I had put so much into. The entire reason I went through with the show—stunt included—was because I thought I thought it would be a chance to showcase the complex importance of the west Amazon and its creatures to a wider audience. Saying he was "shocked" sounds disingenuous at best, but Rosolie finds a silver lining. People used the word "deforestation" on TV, he says. Biologists who thought the special was horrific got interviewed and had their names in the media. Basically, he's arguing that successful trolling is the same thing as successful science communication. Discovery got their ratings, and I launched the study I had always dreamed of undertaking. We are on our way to having the first published paper on anacondas in the west Amazon. The question is, was it really worth it? He did some research, sure, but is the impact of his paper really going to counterbalance the way Eaten Alive perpetuated myths about the Amazon, and treated animals like elaborate stunts rather than crucial parts of damaged ecosystems? Maybe all publicity is good publicity when it comes to Hollywood celebrities. But when it comes to science, the same reasoning doesn't apply. Because the problem isn't that people haven't heard of science. It's that they have only heard lies and misrepresentations about science. They've heard climate change is fake, and that animals like snakes and sharks kill people on a regular basis, so it's obviously OK to kill them too. Misrepresenting science in the mainstream media is not a win. It's just more of the same.